A divorced woman, Yasuko Hanakoa, along with her daughter Misato, accidentally murders her ex-husband Togashi. 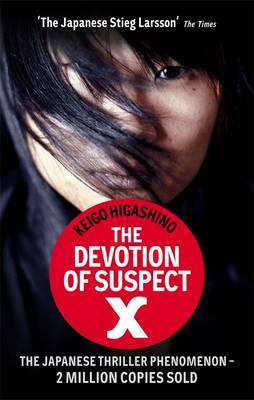 Tetsuya Ishigami, their neighbour, a brilliant mathematician having unrequited romantic feelings for Yasuko, offers to help her cover up the crime. He comes-up with a near perfect plan to dispose the body, leaving the police completely clueless about the crime. Ishigami would have succeeded but for the involvement of Yukawa, a friend of Kusanagi, the investigating officer. A physicist, Yukawa is Ishigami’s ex-classmate and as intelligent and analytical as him. What follows is an immensely interesting battle of wits between these two. An extremely clever, intelligent and well written book, it will definitely surprise you with the way the plot unfolds. It is a cover-to-cover book, very difficult to leave in between once you start. The logic and scientific deduction techniques used reminded me of old classics from Agatha Christie and Arthur Conan Doyle. I strongly recommend this book for lovers of good mystery fiction. PS: This book has sold a whooping 2 million plus copies in Japan. 2 million is more than 1.5% of Japan’s population buying (not reading, there would obviously be more readers) it, probably making it the most successful Japanese book ever.